The United Nations Development Programme joined forces with the World Blind Union to prepare a new report aimed at facilitating Asia-Pacific countries’ ratification of a treaty designed to help visually-impaired people access special format books. 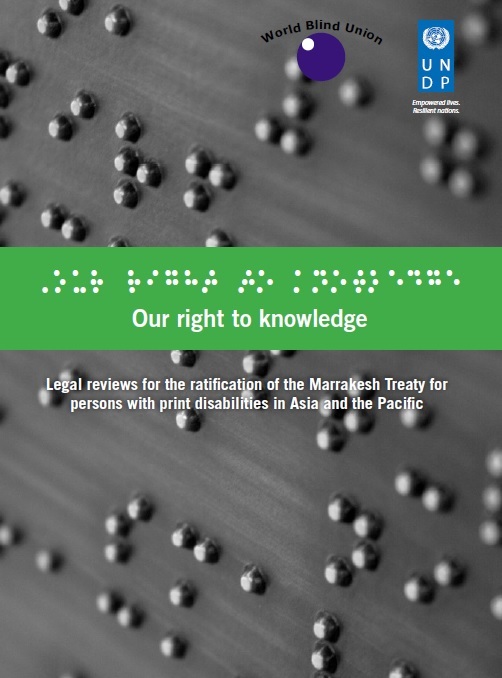 The report [pdf] launched today: “Our right to knowledge: Legal reviews for the ratification of the Marrakesh Treaty for persons with print disabilities in Asia and the Pacific,” is part of a joint partnership initiative between the UNDP Bangkok Regional Hub and the World Blind Union – Asia Pacific (WBUAP). The Marrakesh Treaty to Facilitate Access to Published Works for Persons Who Are Blind, Visually Impaired, or Otherwise Print Disabled (the Marrakesh Treaty) was concluded in 2013 (IPW, WIPO, 26 June 2013). It has been ratified by nine countries so far, with two additional accessions. The treaty will entry into force after 20 countries ratify it. According to the report, it is “intended to facilitate policy dialogue, legal reforms and community engagement in the Asia-Pacific region with respect to efforts to ratify” the Marrakesh Treaty. The report provides case studies of three countries “with advanced efforts in the implementation of the Marrakesh Treaty,” and surveys six other countries in the Asia-Pacific. The report, according to its executive summary, provides legal recommendations to implement the treaty. Those with disabilities, says the report, lack access to information, impacting their chances of getting education and employment and leading to higher rates of poverty. It is estimated that seven percent of all books are made in accessible formats, it says, in what is known as the “book famine,” and the situation is worse in smaller low-income countries. The report explores the efforts of India, Mongolia, and Thailand in ratifying or acceding to the treaty. “Other countries in the Asia-Pacific region that would like to ratify the Treaty can follow the leadership of these countries in their own efforts at implementation,” the authors said. The report provides an analysis of current copyright laws of Cambodia, China, Fiji, Indonesia, Nepal and Vietnam, and offers recommendations for implementing legislation that would be appropriate in the context of each country’s domestic situation. In the case of Cambodia, the country has signed the Marrakesh Treaty. Visually impaired people represent the largest share of people with disabilities in Cambodia, says the report. The current copyright law of the country does not include any provisions for those with print disabilities. To take full advantage and comply with the Marrakesh Treaty, Cambodia’s copyright law should thus be amended to create an exception to allow for the creation and distribution of accessible format copies, and to allow the cross-border exchange of these copies, analyses the report. China, which has also signed the treaty, has the world’s largest population of people who are visually impaired, says the report, with “just over 17.3 million people.” The country also has a rapidly aging population, which is expected to increase the population with visual impairment, the report found. The report was authored by Jonathan Band and Krista Cox, legal experts from Policy Bandwidth in Washington, DC. "New UNDP-Blind Union Report Helps Asia-Pacific Nations Ratify Marrakesh Treaty" by Intellectual Property Watch is licensed under a Creative Commons Attribution-NonCommercial-ShareAlike 4.0 International License. So in Marrakesh there was disagreement as to what was ”appropriate’. Now that it’s ratification time, those chickens maybe be coming home to roost.